« Happy 1st Birthday, Quinn! The clothes that keep me stylish. (And lets me know what team to root for). The diapers that keep my bum dry. The socks that keep my toes warm. The toys that keep me smiling. And the advice that help Mom and Dad know what to do! I love that we’re able to pass these things on to Colleen (I’ve been saving them!) and am so grateful for everything that’s been passed down to us, from family, friends and even strangers. Sometimes I wonder how—and why—the big box baby stores do so well when there are so many beautiful, useable and wearable used baby items out there. A summer goal of mine is to return bins, clothes, toys, bottles, Bumbos, a breast pump, books and many, many other baby-related things to their rightful owners—and pass along what isn’t wanted back to someone else who wants and needs them. Reuse and recycle—words so popular today yet so much a longtime natural part of raising children. Craigslist is a form of this. As are garage sales, Goodwill and consignment shops. It pains me to see toys that could easily be cleaned or repaired out on the curb for trash pick-up. An Exersaucer should last many, many children. As should links. And plastic cars. And baby dolls. And even items that get significant wear, like strollers. I think about Bumbos. They’re easy to clean and practically indestructible. But they’re expensive. And they’re only used for about a year. They’ve been around for awhile (but are new enough that our parents wonder what they are and then comment on the fact that they never had—or needed—them when we were babies). And yet they’re on every registry I print out. One was on ours, when pregnant with Sophie. But shouldn’t there be enough used ones to go around for this year’s newborns? I understand new is nice and I appreciate the many new things we have. But I also wish I had sought out more used things when pregnant the first time around. It’s something I did much more of when pregnant with the boys. I had had several generous showers with Sophie. I didn’t want another shower for the boys. But yet I needed double of many things. Used was so easy to come by. And helpful, to us, financially, and to other parents, eager to create space in their basements and attics. So pass along, don’t throw away. And if you are in need of something baby-related, do let me know. Now that the boys are 14 months, our attic is quickly filling with all those plastic things that made our lives so much easier those early months but are already no longer needed. And I’m eager to return the kindness that was given to us. And yet, I confess: While I’m happy for the growth, it’s surprisingly hard to let so many of these things go. 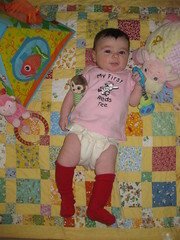 I remember when my parents gave Sophie that Reds T-shirt. And I remember the first game she wore it to, how she acted, what the weather was, how excited I was to take her. But even though I no longer have the shirt, I have the memories. And pictures. And little space. And no matter how loved, I believe a thing in use is better than a thing stored away, to what? Stumble across in a dusty box 10 years from now? No, I’d much rather see a picture of my niece in my inbox, ridiculously dressed up to show off what’s been given, what’s passed and what’s to come. This entry was written by kara, posted on July 29, 2011 at 12:36 am, filed under Uncategorized and tagged colleen, family, stuff. Bookmark the permalink. Follow any comments here with the RSS feed for this post. Post a comment or leave a trackback: Trackback URL.